Merieme Chadid is an Explorer and Astronomer. She is considered the first astronomer in the world to have been committed to install a large astronomical observatory in Antarctica and was the first to place an Arab flag (Moroccan) at the South Pole. She is also one of the first pioneering astronomers to install VLT telescopes in the Atacama Desert in Chile, the driest desert in the world. Chadid has been honoured by the World Economic Forum as Young Global Leader and by the MY HERO project. She was listed as one of the 30 most fascinating workers in the world by Forbes Magazine. 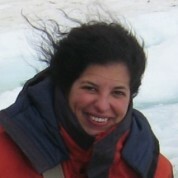 Chadid received her PhD in Astronomy and Space from Paul Sabatier University and completed several executive education programmes at Harvard University. Her research fields are focused on stellar and universe evolution. Her scientific discoveries are published in numerous international reviews and books. She gives lectures and supervises PhD students. I am delighted to have been selected to join the Academy for the Global Teacher Prize. Teachers play an important part in society, and this award seeks to recognise, celebrate and strengthen the teaching profession. I would like to encourage all of us to nominate a teacher.